RaceWire | Norman Bird Sanctuary's 13th Annual 5K in memory of David Leys Jr.
Norman Bird Sanctuary's 13th Annual 5K in memory of David Leys Jr.
Get your Father's Day weekend off to a great start! With a USATF course that brings participants past some of the most breathtaking scenery in the state, it is no wonder that it was voted “Best 5K” by RI Monthly magazine. Children can participate in their own fun run, sponsored by Frosty Freez. A local DJ provides the music to get everyone moving! As a wildlife sanctuary, Norman Bird Sanctuary's mission does not allow dogs on the property. Only service animals permitted. 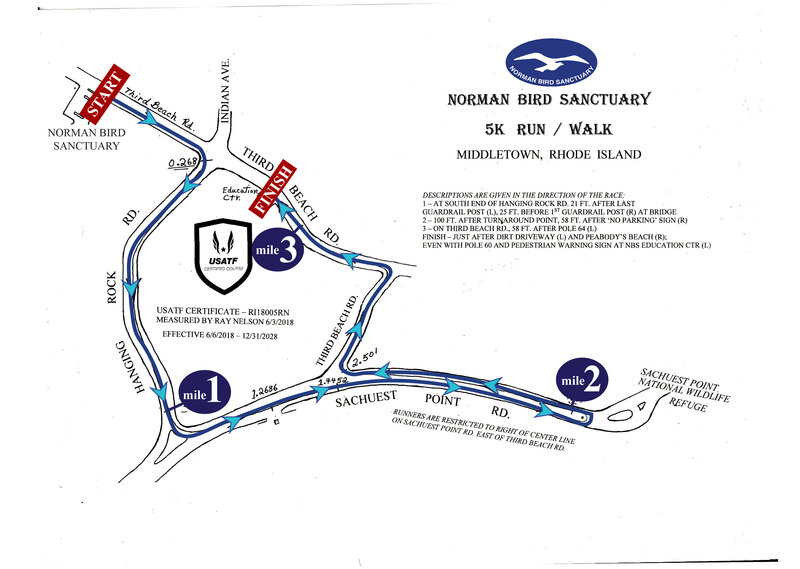 A major fundraiser for Norman Bird Sanctuary, this race remembers David Leys Jr. who was integral to the organization of this event from the very beginning and a great friend. After a courageous five year battle against ALS (Lou Gehrig's disease) Dave passed away in August of 2017. This short fun run is sponsored by local ice cream favorite, Frosty Freez, voted "Best Ice Cream in Newport County"! All Kids Run participants awarded with a coupon for ice cream at Frosty Freez! All kids must register to participate. In exchange for your sponsorship contribution, we are pleased to offer your company visibility to hundreds of enthusiastic participants and spectators - and thousands more members and supporters - who are passionate about this remarkable treasure. We offer 100% cotton Adult 5K Logo shirts for sale through May 30th at $8 each. A limited number of shirts will be available for sale on race day. Kids special Norman Bird Sanctuary cotton T's are available for purchase throughout registration and on day of race at $5 each. Not running? We would love to have your help at registration, on the racecourse or passing out drinks...why let the runners have all the fun? Get involved yourself! Why not make a weekend out of it? Treat Dad to a special Father's Day with a stay in the incomparable Paradise Farmhouse located on the sanctuary property overlooking the fields and ocean. When the sanctuary closes at 5:00pm, you'll have the seven miles of trails to yourself to explore and enjoy the sun setting from Hanging Rock. Don't let the day at NBS end with the 5K. Gather 16 friends & family and create memories to last a lifetime. For information, please contact Jeannie Santos, Guest Services Manager. farmhouse@normanbirdsanctuary.org or call 401-846-2577 x18. I assume all risks associated with running in this event, including, but not limited to, falls, contact with other participants, the effects of weather, traffic, and conditions of the road, all such risks being known and appreciated by me. Having read this waiver and knowing these facts and in consideration of you accepting my entry, I hereby release the Town of Middletown, MIddletown Police Department, Norman Bird Sanctuary, Race Officials, Volunteers, and all Sponsors, their representatives and successors from all claims or liabilities of any kind arising our of my participation in this event.